Hologram.io is a cellular connection platform changing the data connection game with a Free SIM cards and 1MB of data per month (for life) via their developer plan. Hologram is trailblazing to say the least and their platform lets you interact with the devices easily to route incoming and outgoing messages, all via a secure and scalable API. Matching Hologram with Ubidots unlocks 1,000s of IoT solutions at extremely affordable prices (if not free). For more on the Hologram Platform and its history, check out: "Konekt is now Hologram - A Cellular Platform for the internet of Things"
With this guide, an IoT solution in mind, and Hologram's Dash in hand, you will learn how to setup a cloud-to-cloud integration using the features and tools provided by Hologram and Ubidots! 1.- First, activate the global SIM card for connecting to the Hologram cellular network. If you don't know how activate the global SIM card, please reference this link, follow all the steps, and return back to this article. 2. Once the SIM card is activated, insert the SIM card and plugin the atenna into the SIMCOM module. NOTE: Before running our examples please, download Adafruit_FONA library and run FONAtest example to verify the connectivity of the module. Every time the SIMCOM module sends a message over the cellular network, its first destination is the Hologram Cloud, but the message's journey doesn't have to end there! Using the Cloud Services Router (CSR) you can forward your data to Ubidots via HTTP for additional analytics and visualization for your IoT solution. Routes in the Hologram platform provide convenient methods to trigger actions (Data storage, Email, SMS, Webhooks, etc) by the presence or even absence of a device message’s topic. 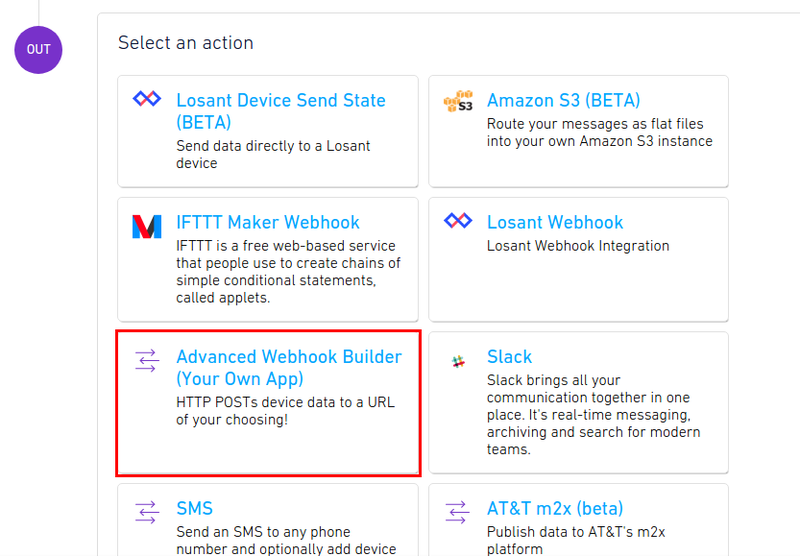 In this case, we're going to trigger a Webhook action to forward the module's messages to Ubidots to simple display. 1.- Go to the Routes section from the Hologram Dashboard and click the "Add new route" button. Once you've entered the parameters, reference the image below to verify. 1.- Download the Arduino IDE if you not already have it. 2.- Select your Arduino UNO from Tools > Board menu. 3.- Additionally, we need to be able to communicate with the Arduino so be sure to select the correct port com with your computer. 4.- Next, go to the library repository to download the Hologram SIMCOM library. To download the library click the green button, "Clone or download," and select "Download ZIP". To generate the key, just press "Generate new CSR key". Once the key is generated, assign it into the code where is required. 9.- Once you've pasted the code and updated the device key, you must Verify this within the Arduino IDE. To do this, in the top left corner of our Arduino IDE you will see the below icons. Choose the "check mark" icon to verify any code. Once the code is verified, you will receive a "Done compiling" message below in the Arduino IDE. Next, your have to upload the code into your Arduino UNO. To do this, choose the right-arrow icon beside the check mark icon. Once the code is uploaded, you will receive a "Done uploading" message bellow in the Arduino IDE. 10.- Open the Serial Monitor to visualize the response of the SIMCOM module and the data sent to the hologram cloud. To do this, in the top-right corner of our Arduino IDE select the "magnifying glass" icon to display a serial monitor. NOTE: Wait a couple of moments until the device initializes the connection, and sends the message to the Hologram Cloud. How to adjust the Device Name and Variable Name. In only a few minutes you've built a cloud-to-cloud integration between Hologram's cellular connectivity and Ubidots for your IoT solution. Now it is time to create a dashboard to control and manage the variables of your new device(s). To learn more about Ubidots widgets and events, check out these video tutorials.